Last week, President Obama hosted Turkey’s Prime Minister at the White House. As is common in these sorts of affairs, following their meeting, they two held a brief press conference. And it started to rain. So President Obama asked two Marines to bring some umbrellas. No big deal, right? Well, not to most of the world. But I wonder what the right-wing might think of this? Yes, you read that correctly. Daily Caller is criticizing President Obama for making two Marines violate Marine Corps regulations by holding umbrellas. Daily Caller even suggests that the President doesn’t have the authority to request that a Marine carry an umbrella. Seriously. This is what passes for journalism in the far right echo chamber. Out of curiosity, what do you suppose the purpose of that regulation is? Was the regulation adopted to prohibit Marines from ever carrying an umbrella or from carrying an umbrella to protect themselves? Note that in the rule pertaining to female Marines, the regulation requires that the umbrella be held in the left hand so that the hand salute can be properly rendered. Anyway, you know what’s coming, don’t you? Articles that are not authorized for wear as a part of a regulation uniform will not be worn exposed with the uniform unless otherwise authorized by the Commandant or higher authority. It would seem to me that the Commander-in-Chief qualifies as a “higher authority” wouldn’t you? 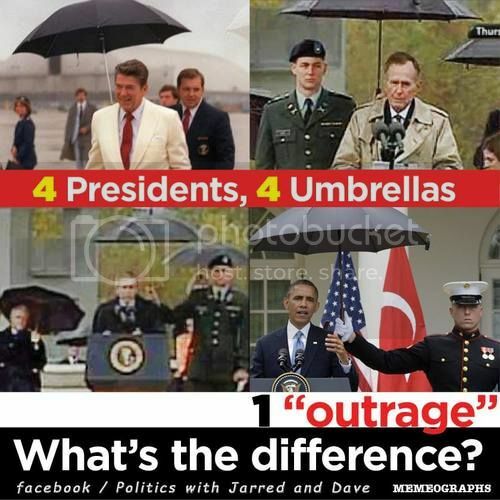 More importantly, why do you suppose that people are noting that President Obama asked Marines to hold umbrellas in the first place? Is it because they’re that worked up over a highly technical interpretation of Marine rules? How worked up are these same people when our military desecrates enemy corpses, engages in torture, or kills civilians? I thought afro-sheen was waterproof? Just another occasion where Obama shows his “superiority” to any and everyone around him. Shameful. Just another example of the illegitimate Kenyan illegal alien’s arrogance, ignorance, and contempt for the military - and the Marine Corps in particular. Next they’ll be carrying shopping bags for Michelle as she strolls ‘Miracle Mile’ looking for a bargain. The MONKEY BOY BATH HOUSE QUEEN WOULD MELT if SHE GOT WET!!!!! Too funny! The first black man given the opportunity to run the most powerful country on earth and he turns out to be no different than all the other two bit corrupt black dictators around the world. For all the world to see no less. Way to go BO! Someone…please throw some shoes at this Kenyan clown!! Those are a few days old now. There are more. Many, many more. An no, not every comment at Daily Caller reads like these; there are even some that defend President Obama. But to say that the vast majority of comments are both unfriendly and disrespectful would be an understatement. You can also find comments advocating virtually every anti-Obama conspiracy you can contemplate (from disbarment to forged absentee voting records and so on); some even refer to President Obama as a traitor. No, not a Marine; just a campaign aid. This is, of course, in contrast to President Obama who would never hold his own umbrella when walking down the steps of an airplane. But certainly other Presidents haven’t had to rely on others to hold their umbrellas, right? Females may carry and use an umbrella, only during inclement weather, when wearing the service (class A and B), dress, and mess uniforms. Umbrellas are not authorized in formations or when wearing field or utility uniforms. Seriously, how do people rationalize criticizing President Obama for asking the Marines to hold umbrellas but aren’t critical of Presidents Bush for allowing members of the Army to do so? I will resist the urge to make any comment. Nope. Lips are sealed. Not gonna happen. So why do you think that there is such outrage (feigned or otherwise) over President Obama asking the Marines to hold up umbrellas for he and the Turkish Prime Minister? With incidents like this, it gets harder and harder not to attribute the right wing’s animus toward President Obama, at least in part, to racism. The rage of the right you’ll see. Because the GOP is so predictable, I bet you could take anything out of the news related to President Obama and easily write the Right-wing talking points before you heard their farcical commentary. After a long search we can get it rate compares site and through we will get the best deals for hotels and quickly arranged all the arrangements easy to navigate, when we arrive to the hotel booking sites USA the Staff was very nice even if we had some difficulties to be understood in the restaurant.